Fat Bruce Lee and I really are champs. 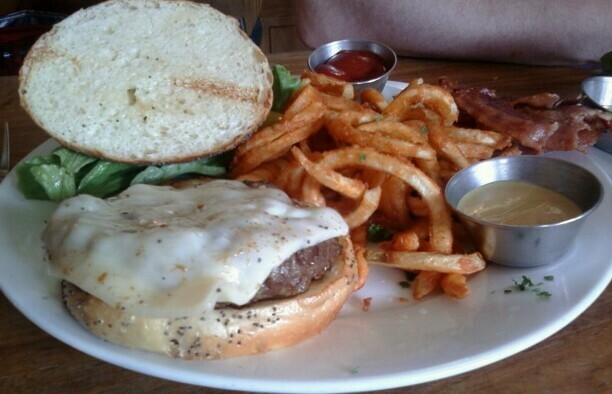 We attempt to choke down a wide array of burgers so that you don't have to. Today, we popped into Library Alehouse in Santa Monica to sample what was one of the blandest and uninteresting things that we have tried to date. We ordered two of the Alehouse Gourmet Burgers--one Kobe and one Grass-fed Bison--both were $14. We cut them in half and had them "best of both worlds-style." However, in the case of Library Alehouse, we discovered that there was no "best of" anything. "Gourmet" does not mean what they thought it meant. The Beef: In the case of the Kobe, it was finely ground Kobe Chuck and Neck cuts. The Kobe beef was amazingly bland in terms of beef flavor while unfortunately strong on the iron notes. 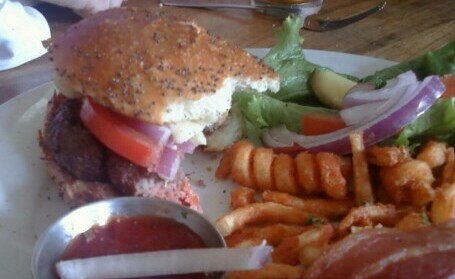 As a result, this burger tasted like a bloody nose with a hint of funk. It was truly unpleasant. In the case of the Grass-fed Bison, a similar issue was present. The bison meat tasted gamy, and that was it. There was no richness, no umami, no meatiness--just a gamy taste. This was also most unpleasant. It was a dead tie for which of these burger patties tasted the worst, because both brought an atrocious blandness and a unique off-putting element to the game. At 8 oz. these were hefty chunks of wasted potential. The Sear: Meh. They grilled these bland pucks of joylessness, and the grill marks added nothing in terms of flavor or texture. The Seasoning: A half-assed attempt was made at applying proper seasoning to these twin monuments to blandness, but the meager seasoning failed to be detected in the bite. The Preparation: They got the Bison to Medium, but that grilled the Kobe to Medium-Well. In spite of the over-cooking of the Kobe Chuck, no strong, interesting, or beefy flavors were generated. The Cheese: Meh. 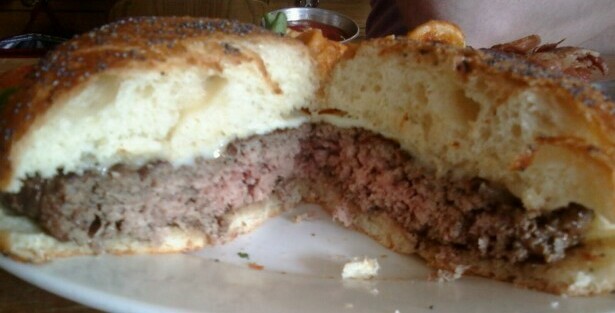 The Monterey Jack that we ordered showed up un-melted atop the burgers. 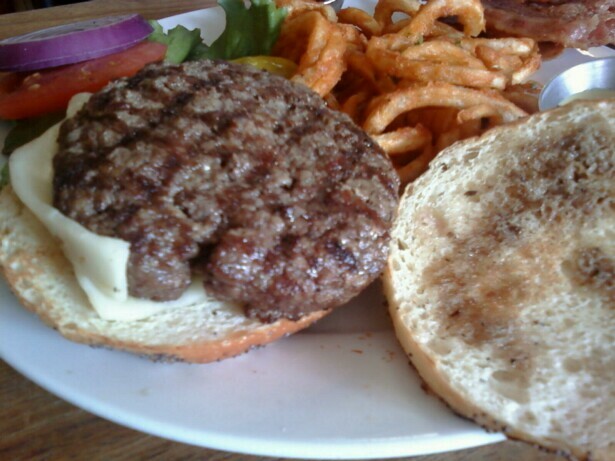 In spite of the blandness of the burgers, the cheese failed to make an appearance on the palate. Upon tasting the cheese by itself, we discovered that Library Alehouse is damned thorough in keeping to a culinary theme. They found the blandest, most insipid, timid, characterless Monterey Jack cheese that I have ever encountered. The Bun: Wait for it.............bland. 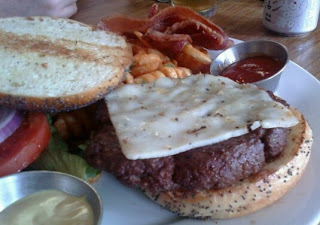 Sadly, the bland, poppy seeded, bun was the least useless thing on this cheeseburger. Still, it was bland and completely without character. Meat to Bun Ratio: The burgers were sizable, so this looked like a tie, but the burgers were also pretty dry, and the cheese didn't pitch in, so this was a dry dish, and the bun outpaced the meat. Honestly, who cared? We couldn't finish these Weapons of Taste Destruction anyway. The Fries: Yeah, the curly fries were good. If you wanted to drop $14 on a handful of decent fries, you could go to Library Alehouse and drop 14 bucks on 50 cents worth of produce. You certainly wouldn't want to go there for a good cheeseburger--they don't serve them. The Value: La Grande Orange is located just 6 blocks away, and Umami Santa Monica is 1.4 miles away. Neither of those places sucked. The value was terrible--we couldn't finish these awful, bland cheeseburgers.The service was weak, as well. 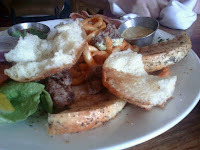 It was abundantly clear that we were not happy with our meals, and the photos illustrate what we could not eat. In spite of that, there was no inquiry as to our satisfaction or the quality of the meal or the reason that we did not attempt to finish. The Library Alehouse must have been in the "bilk tourists once" business rather than the "repeat customer/positive word-of-mouth" business. It was as if the "chef" at Library Alehouse got together with the members of Matchbox 20 and Giant Panda Guerilla Dub Squad and said, "Boys, let's do to cheeseburgers what you did to music." Three bites in, I asked Fat Bruce Lee to punch me in the face--I so desperately wanted to feel something. Could not choke this disaster down: will never return. Burger Review : NO! This was worse than an airline meal.